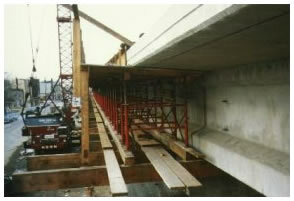 A wide, heavy overhang on this roadway bridge was formed with a custom system furnished by SCI. 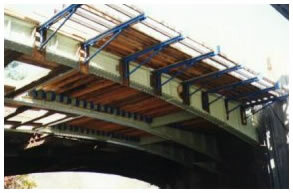 Needle beams were hung from the pre stressed concrete bridge. Girders which supported the formwork system that was designed for lowering and sliding, as this elevated structure was approximately one half mile (0.80 km) long. A Custom engineered and manufactured Formwork & Falsework System utilizing SCI's 6.5"; (165 mm) Aluminum Joists and Standard 7" (177.8 mm) Aluminum Strongbacks for this bridge rehabilitation project. The overhang system was used for the construction of the new concrete overhang and as a pedestrian walkway. Custom hangers, pedestrian protection, fencing, etc. also provided by SCI. 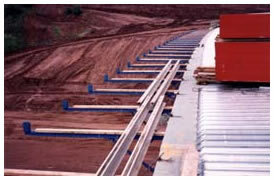 SCI's Bridge Deck Overhang Brackets, designed and used for the construction of the overhang concrete deck, and also as a work deck for the construction of the concrete parapet. Adjustable Joist Hangers with 2" x 8" (51 x 203 mm) timber joists were used to form the interior concrete decks. 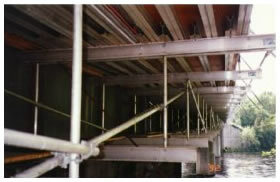 This extra wide bridge deck overhang on a major interstate highway in the United States was easily formed with the use of SCI's 6.5' (165mm) Aluminum Joists &Bridge Deck Overhang Brackets (with extension channels) that also provided a safe walkway area for workers to move easily along the length of the bridge. Note the guard rail post receptacle at the end of the Overhang Brackets.